Got a friend who's just started surfing who needs to learn lineup etiquette? Here's a comprehensive guide to save you the hassle of teaching them. One of the first things every newbie surfer should learn before paddling out is the rules and etiquette that govern the lineup. Surfing etiquette has been developed over many generations and is important to ensure people avoid collisions and everyone gets their fair share of waves. However, the rules are also determined by the slightly more ambiguous hierarchy that exists within surfing. Generally, locals at a spot, and the most proficient surfers in lineup are allowed to take more waves, particularly on the good days. If you are a novice surfer, however, or visiting a spot, you should follow these rules as closely as possible. The most simple rule to understand is the drop in rule. Whenever you start paddling for a wave, the first thing you should do is look both left and right and if somebody is already stood up on the wave, stop paddling for it. On waves that peel across the beach ‘the peak’ is the steepest, tallest section of the unbroken wave, or, if the wave is already breaking, it’s the bit of unbroken wave immediately adjacent the white water. If several surfers are paddling for the same wave, it is the person closest to this peak who has right of way. If you are on their inside (ie, closer to the shore) and they have caught the wave, you should stop paddling.At areas with a defined take-off spot, there is a vague queuing system. Once you’ve taken a wave you should join the back of the queue, by sitting a little further inside, only paddling back to the peak when those ahead of you have paddled for or caught a wave. Ignoring this rule, and repeatedly paddling back to the peak and catching a wave before others have had one is called snaking. Don’t do it. If there are a lot people and not many waves, you can always elect to sit a little further inside and pick up smaller waves that have been left by those further out the back. 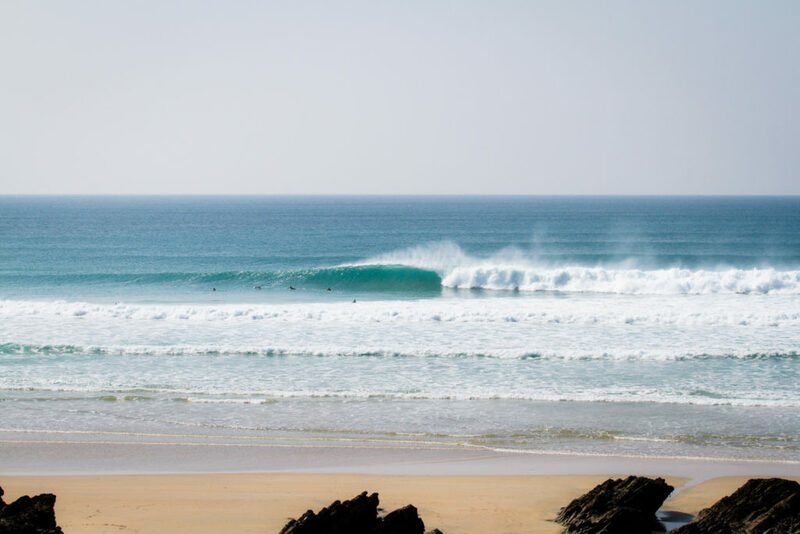 A perfect right hand peak at Fistral. Here, the surfer furthest out and nearest to the breaking part of the wave has priority over the three surfers further along the line. There are, unfortunately, many exceptions and caveats to these simple rules that make things more complicated. If waves are popping up all over the place, rather than breaking in the same area every time, the queueing rule becomes less clear cut. 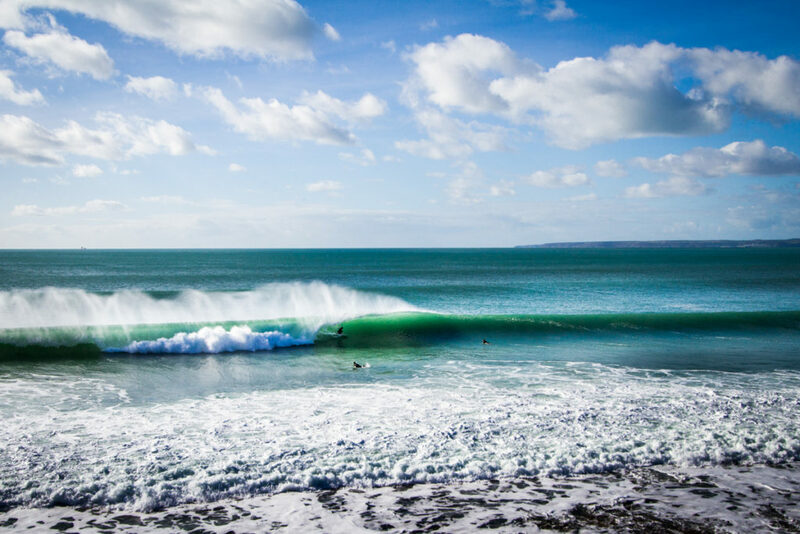 In instances where you are constantly moving around the lineup, catching waves in lots of different places, you’ll have to rely on a more general sense of fairness when it comes to sharing waves. If you are on a longer board, and can catch the waves further out than others, it’s ok to paddle further out the back, but again, you should still make sure you are only taking your fair share of waves. When paddling out always paddle wide (over to the right of this image) of towards the white water (over to the left) to avoid getting in the way. When paddling out, you should either paddle wide of the take off spot, ie across the beach, and out, or out through the white water. Don’t be tempted to paddle out through the middle of these two zones where the unbroken waves are, as you will end up getting in someones way. 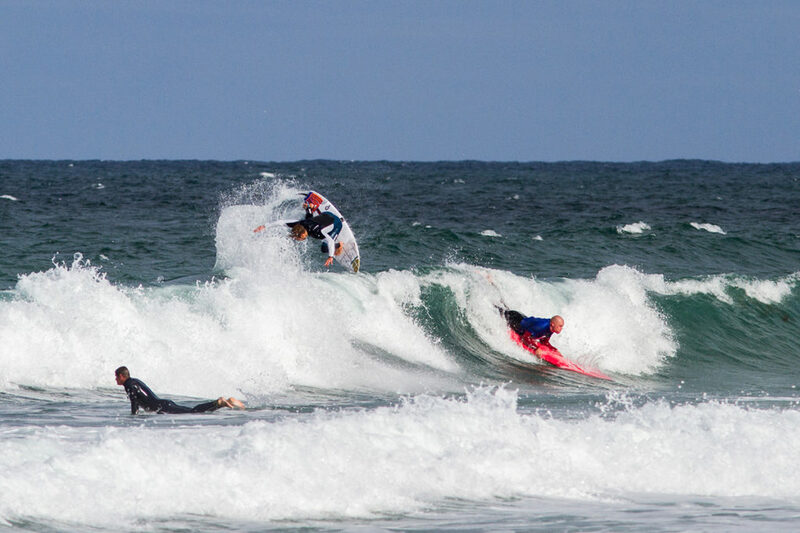 When making your way out through the waves, always check that there is no one behind you before ditching your board. Just to complicate things more, there are a few instances where some people believe dropping in is justified. If you’ve been deemed to be taking more than your fair share of waves, or the person on your inside deems that you are not going to make it round the breaking part of the wave to the open face, they may drop in on you. If you do get dropped in on unjustly, give a little whistle or a friendly ‘yo’ and the person will usually kick out. If you accidentally drop in on someone else, kick out as soon as you can and apologise. Be respectful, stick to these surfing etiquette rules and you should find yourself getting plenty of waves at most beginner to intermediate spots without an issue!